The ideal solution for reading on a mobile computer? A new Apple patent has been unearthed which reveals that the Cupertino firm is considering the development of 'hybrid' e-ink-LCD displays, for those users that want the best of both worlds. Hybrid displays have already been developed commercially by the likes of Pixel Qi, and recently seen in devices such as the (lesser-spotted) Notion Ink Adam tablet. Hybrid Apple tablet on the way? Apple's new patent details a hybrid display which could enable the user to switch all or part of a full-colour LCD screen to a low-power e-ink display, which would be viewable in full sunlight (and help to preserve battery power). It seems almost inevitable that some future iteration of the hugely successful iPad will make use of such a technology, following the runaway success of iBooks on Apple's tablet computer. The suggestion of a new Apple display technology that would allow part of your iPad or MacBook screen to display static text in e-ink, while allowing other parts of the screen to display video and multimedia in traditional LCD will also be of interest to newspaper and magazine publishers, constantly looking for new ways of developing and making money from their content on new digital platforms. 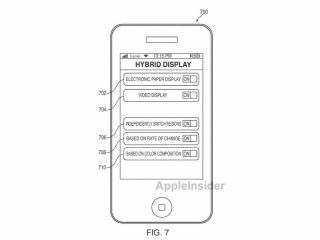 Apple's new patent application detailing its plans in this area, filed with the U.S. Patent and Trademark Office this month, was named, quite literally: "Systems and Methods for Switching Between an Electronic Paper Display and a Video Display."